The stakes were huge on the Top Chef finale this season, but where in the world did they find that itty-bitty cut of beef, a doll-sized doppelgänger of the winner’s most memorable dish? Leave that to the folks at Tiny Kitchen, who partnered for the first time with the Bravo reality competition to re-create a couple of recipes from the two finalists. 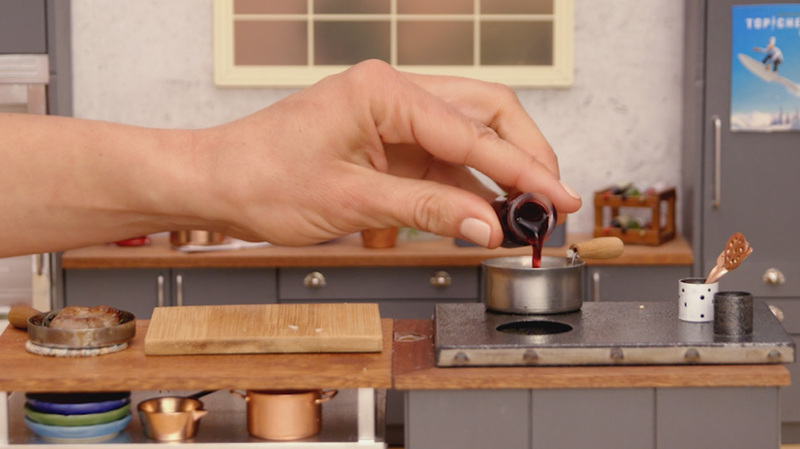 While commercials ran on a split screen, a pair of human-sized hands whipped up an entree (Manzo di Colorado beef ribeye from Joe Flamm) and an appetizer (dashi spoonbread from Adrienne Cheatham) in the Tastemade brand’s micro-kitchen. Bravo has been experimenting with the split-screen format all through the 15th season of Top Chef, set in Colorado, airing behind-the-scenes snippets of the show on one side while sponsor ads run on the other. A number of broadcast and cable networks have done the same, including Bravo sibling NBC during the Winter Olympics, pointing to research that suggests viewers are staying put and absorbing the ad messages along with the additional content. This was the first attempt at blending the Lilliputian scale of media darling Tiny Kitchen (835 million global views and counting) with reality TV’s up-and-coming culinary giants. The result: Dishes cute enough to wipe the scowl right off Tom Colicchio’s face.